While festivals are known for their massive, music-hungry crowds, overpriced beers and Frank Ocean cancellations, rarely are they regarded for their prioritizing cleanliness. 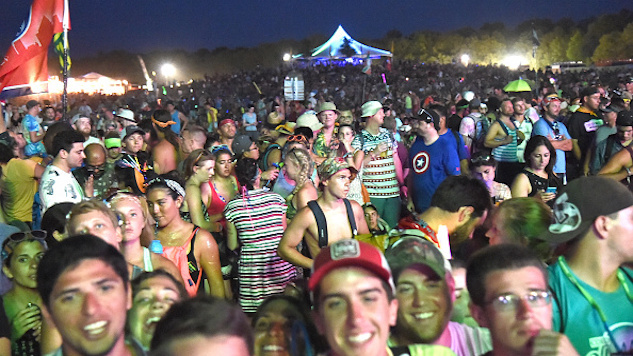 That is, until now: One of the muckiest festivals of them all— Bonnaroo, Tennessee’s tent-infested, porta-potty village of a rock fest, which runs this Thursday, June 7 through Sunday, June 10—is this year offering a free laundry service to wristband-holders. So if your gear gets a little too dusty during Paramore, don’t worry: A team of brave souls (all moms?) at the LaundROO station will wash, dry and fold your pile of grimy band T-shirts or other festival wear, ready to be picked up in time for the next day’s mellower Bon Iver set, so you can dance your feet off during “Rose-Colored Boy” without fear of smelling like a sock during “Skinny Love.” And the service is completely free! The station, sponsored by laundry machine manufacturers LG, is a 3,600 square-foot haven near festival center, housing 25 washing machines and dryers. There’ll also be a vintage clothing swap where festival-goers can leave attire they no longer want and trade in for something left behind by another person. That stuff will be washed and racked, too. Better yet, all the left-behind clothing will be donated to United Way of the Greater Clarksville Region, The Tennessean reports. Headlining this year’s Bonnaroo Music & Arts Festival are Eminem, The Killers and Muse, but the lineup is so much more than its big names. For the entire lineup and schedule, visit the Bonnaroo website, consult our daily breakdown here or check out just the complete lineup below. Bonnaroo is this weekend, June 7-10, in Manchester, Tenn. Revisit our gallery of artist portraits from last year’s festival for a walk down memory lane.